Earlier this month, the governor of Puerto Rico raised the death toll to 2,975 from 64 following a study conducted by researchers from the Milken Institute at George Washington University at the government’s request. 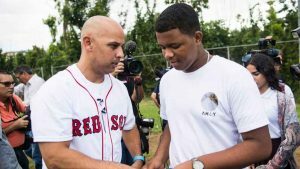 “To be tweeting about 3,000 people … it’s actually disrespectful for my country,” said Cora, a former player from Caguas, about 20 miles south of San Juan. “We see it that way. I know probably he doesn’t feel that way. And like I said: Hey man, thank you for helping us. He went down there, he did what he did.